Lea is one of our best-selling furniture sets on ebay. This set is perfect for arranging a small living room. 4 open compartments in 2 floor cabinets make a great space for your books and home electronics. 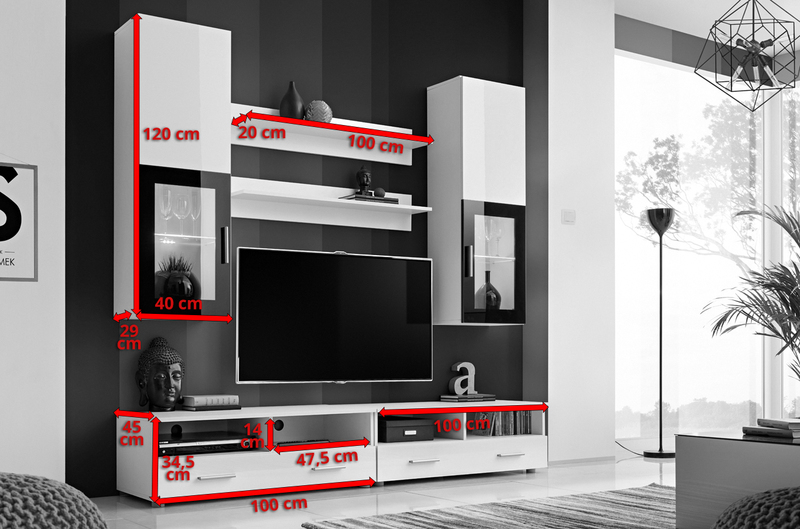 Another advantage are LED lighted shelves in wall units, which gives to your furniture set modern look. This set comprises of: 2 floor cabinets with drawer and 2 open compartments, 2 wall units and 2 shelves. Fronts: High gloss or matt (wooden finishes), depending on your choice. Materials: MDF (16mm thick) and laminated chipboard. LEDs: Optional (blue, white, multicoloured with a remote). Wall fittings: Only for concrete and brick walls. Warranty: 12 months, free replacement parts in case of transport damage. Comes flat packed with all the fittings and manuals needed to assemble the unit.